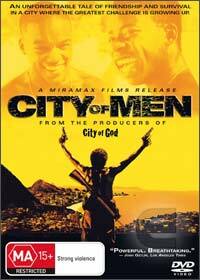 Following on from the internationally acclaimed movie "City of God" by director Fernando Meirelles, City of Men directed by Paulo Morelli who now takes the reigns follows the story of two best friends, Acerola and Laranjinha who have grown up on the dangerous streets of Rio where drug gangs rule the streets. Each of the friends have unique and sometimes convoluted history such as Acerola finding it difficult to take responsibility of his son or Laranjinha who grew up fatherless decides to seek his father. Unfortunately for both these close friends, they have strong ties to a violent gang that eventually draws them into a deadly war between rival gangs. The scenes in City of Men are quite powerful, especially the cinematography of these dark alleys and ghettos of where the film is based. In its essence, it's a story of how two men attempt to normalize the world that they live in and whether they accept the pressures of their gang or become men who can walk through society. Gripping from start to finish!